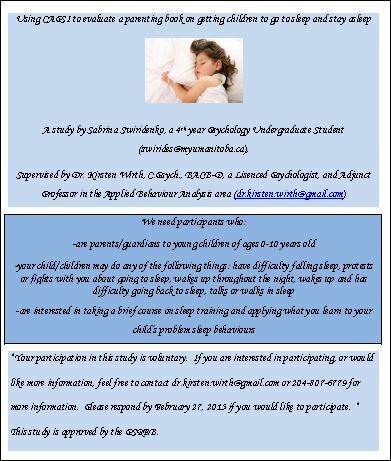 Join our research study using CAPSI to evaluate a parenting book on getting children to go to sleep and stay asleep. Supervised by Dr. Kirsten Wirth, C.Psych., BACB-D, a Licensed Psychologist and Adjunct Professor in the Applied Behaviour Analysis area. Contact us for more information at dr.kirsten.wirth@gmail.com or (204) 807-6779. This study is approved by the PSREB.